If you're in New York City, the Museum of Chinese in America invites you to MOCAREADS: Re-imagining Asian American (and American) Poetry. Join scholar Dorothy J. Wang and contemporary Chinese American poets Marilyn Chin, Paolo Javier and John Yao in a dialogue about the impact of racial subjectivity on the conception of Asian American poetic form, craft and aesthetic. It's happening this Thursday, June 10 at MOCA. 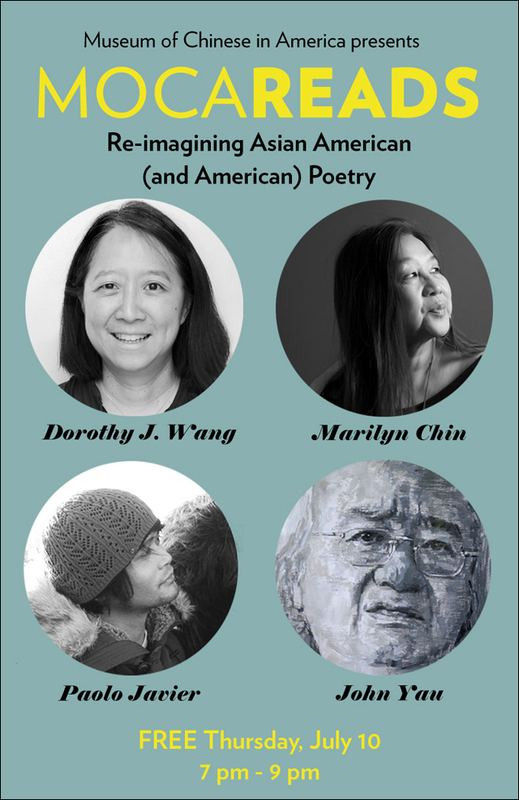 Join scholar Dorothy J. Wang and a gathering of contemporary Chinese American poets in a dialogue about the impact of racial subjectivity on the conception of Asian American poetic form, craft and aesthetic. Marilyn Chin, Paolo Javier and John Yau will perform original work showcasing a range of aesthetic styles within the field of Asian American poetry, from traditional lyric to avant-garde. For further information, and to register for the event, go to the MOCA website.